By Dennis W. Viau; modified from a fan’s (Michael) recipe. 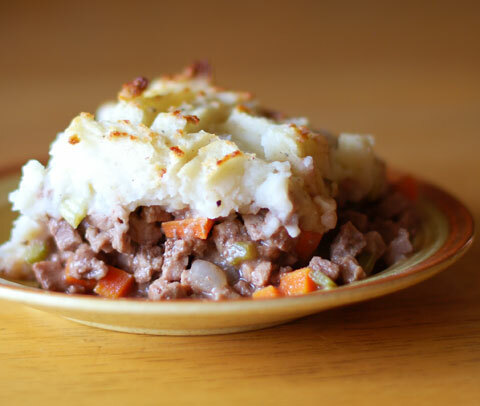 Shepherd’s pie isn’t fancy food. This meat and potato pie supposedly originated out of a need to make economical use of the leftovers from the “Sunday roast.” The original recipe used 2 pounds of potatoes and 1 pound of lamb. As you can appreciate, the predominant flavor was mashed potatoes. I changed the proportions and added fresh chopped vegetables to make this a more nutritious and appetizing meal. Think of it as comfort food. If using whole lamb meat, cut it into small dice, similar to the size of diced carrots, or grind it in a food processor or food grinder. Coarsely chop one carrot, one stalk of celery, and half the onion, reserving the rest of the vegetables for a later step. Place the meat and chopped vegetables in a deep roasting pan, add the stock, rosemary, and pepper (and salt if desired). Cover and bake in a 275°F (135°C) oven for two hours. While the meat is cooking, peel and chop the potatoes. Boil until tender. Mash with the butter, milk, salt, and pepper. Cover and set aside. If you don’t have cooked flour, prepare it while the meat is cooking. Place about half a cup of all-purpose flour in a stainless steel skillet over medium heat. Whisk the flour as it cooks and changes color to a light golden hue. Remove from the heat and continue whisking while the pan cools (otherwise it will scorch on the bottom). Remove from the pan and set aside. You can store the unused portion of cooked flour in a jar in the cupboard for making gravy or roux. When the meat has cooked 2 hours, strain through a colander or strainer to capture the stock. Pour half the stock in a skillet over medium heat. Use the other half to make a mixture of cooked flour and stock, working in small portions, mixing the flour in thoroughly to prevent lumping. Add the flour-stock mixture to the skillet, whisking constantly, and bring the gravy to a boil to thicken. Continue with the stock and flour until you get a light gravy, adjusting the flour as necessary. The amount of flour varies with the amount it is cooked. The more it is cooked, the less liquid it will thicken. Pick through the cooked meat to remove the cooked vegetables and discard. If they were coarsely chopped in large pieces they should be easy to pick out. Dice the remaining carrots, celery, and onion. Mix with the meat and place in the bottom of a casserole dish. Stir in about ½ cup (120ml) of gravy and even the top. Cover with a layer of mashed potatoes. You can decorate the top with a fork or fluff it to make small peaks. Reserve the remaining gravy for serving at the table. Bake the Shepherd’s Pie in a 400°F (205°C) oven 30 to 45 minutes until the potatoes are lightly browned. Note: There is some controversy surrounding the name. Some argue that shepherd's pie made with beef is cottage pie; whereas, true shepherd's pie is made with lamb (because shepherd's herd sheep, not cows). Although this distinction exists, it is new. Not many decades ago shepherd's pie was commonly made with either beef or lamb, the leftovers from the popular Sunday Roast. For more information, research "cottage pie" on wikipedia.org.